The smart grid will impact virtually every aspect of the distribution system by making system conditions more visible right down to the customer level. This visibility will promote reliability, faster service restoration, enhanced maintenance practices and improved planning. When system visibility is combined with computer analytics and intelligent controls, the result will be to increasingly automate operation of the distribution system. In the future, the smart grid will enable distribution systems that can use sensors and computer analysis to predict system disturbances, take action to avoid their occurrence, and automatically reconfgure the grid to minimize the impacts of faults that do occur. Starting with the customer, smart meters will let system operators know whether a home or business is without power even if it is unoccupied. With additional sensing capability installed, smart meters could also indicate the voltage and power quality at the customers meter. This will allow utilities to better understand conditions throughout their distribution networks. Ultimately, consumers with unique needs for power quality, such as manufacturers with sensitive electronic equipment, will be able to be served by equipment that is designed to provide the power quality that they are willing to purchase. Functionality available for smart meters can also permit automatic initiation and disconnection of service. Moving up into the distribution system, sensors can communicate the operating state of distribution transformers and lines. This information will improve utilities ability to operate the distribution system as it grows increasingly complex. Advanced transformer energy monitoring combined with information from smart meters at customer locations also will provide information on the loss or theft of energy throughout the system. Flexible AC transmission systems (FACTS), a technology that is being used more widely on the transmission system to control power fows is also being introduced for distribution lines. Fault detec-tors and grid automation in some circumstances will allow electrical faults to be automatically located, isolated and the grid restored without operator intervention and within minutes of the fault occurring. At distribution substations, sensors will provide information on loading and operating conditions, station security and physical condition. Communicating this information back to the utility and applying computer analytics to it will allow distribution operators to better understand and control these components, including determining their maintenance needs and risk of failure. This information can also feed into systems that automatically control voltage and reactive power to help maintain delivery voltage and reduce line losses. In summary, this information will assist in optimizing the use of the distribution system and scheduling maintenance work Sensing and communications equipment will be particularly helpful in managing outages and restoring power. Sensors can communicate outage information directly into a utilitys Outage Management System. This system can begin automatically notifying consumers through cell phones or text messages that the utility is aware of the outage and is working on restoration. Subsequent communications can provide consumers with estimated restoration times. Linking service crews directly into the Outage Management System through mobile communications and equipping crew vehicles with Global Positioning System (GPS) capability and access to the utilitys Geographic Information System will allow crews to better understand the nature of outages, see the equipment involved, and go directly to the outage location. An issue for distributors implementing smart grid technologies is the need to collect, cull, manage, store, retrieve and integrate the large amount of data that smart devices will produce. The presentations highlighted the challenge inherent in managing this vast amount of data securely and effciently and turning it into actionable information. There is a risk of collecting data for datas sake and by so doing overwhelming the ability of people and processes to use the data collected effectively. Data produced will need to be accessible to and usable by a variety of distribution utility computer systems including those that control the system, map and locate system equipment, manage outages, handle meter data and billing, and maintain customer information. Enterprise integration, which allows these systems to access the data they need from a common source, using a common format and integrating them through a common service architecture, will be necessary for distributors to achieve the full functionality of a smart grid. The challenge of moving to a smart gird is signifcant from both a technological and human resources perspective. Many of the technologies that will be used to collect, manage and analyze smart grid information are currently being developed. As with all leading edge technologies, there is a substantial risk of false starts and dead ends, and a virtual certainty that integration with existing technologies and systems will prove to be more diffcult than advertised. From a human resource perspective, learning to understand and use the full capabilities of smart grid technologies will require a substantial training effort and opportuni-ties to practice using the new tools in a simulated environment. Current business processes will also need to be modifed in light of the new information available and the capabilities of smart grid technologies.In addition to impacting operations, the smart grid will also enable much more detailed planning as utilities gain more precise information on the loading of their equipment down to the individual customer level. By deploying sensors on feeders, lines and substations, utilities will be able to more accurately determine the need for additional infrastructure and to better analyze which capital additions will provide the greatest system beneft. Better analysis of the timing and confguration of needed capital additions will promote effcient capital spending. As discussed below in the Distributed Resources section, a smart grid is essential if the province is to maximize the generation, storage and demand response resources connected to distribution lines. The distribution grid was originally developed to deliver power to consumers. The sensing and communications that the smart grid will bring are necessary, but not suffcient, to meet the distribution systems expanded role of incorporating substantial amounts of generation safely and effciently. The energy world is about to turn upside down. With the coming of smart grid, the electricity consumer customer becomes the electricity seller; the passive home appliance becomes the active energy manager; and the local 11KV DNO network becomes the power generation network itself. Such an upheaval means that the energy world needs to start thinking about a new business model, says a recent report by IBM Global Business Services Energy and Utilities. The fact that IBM is advising the energy industry is itself a point of interest, yet another signal of the new market opportunity emerging within the energy arena for information technology. This opportunity has drawn the attention of not only IBM, but also CISCO, Google and many others. So how does IBM see the energy business model changing? First consider what it has been for the last century: a grow-and-build model. Utilities encouraged more and more consumption, and they built power plants and transmission to the far corners of the nation to serve the growing demand. But today we no longer need such expansion. The grow-and-build model is obsolete, yet continues to be used by utilities. As a result, utility stocks, which in the 1940s-1960s significantly outperformed the Dow Jones Industrial Average, now lag well behind. Instead of expanding their territory, utilities are being called upon to change their product  to offer energy that is more efficient and clean and service that is more consumer-friendly. 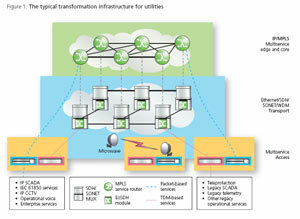 Smart grid technology can help utilities meet todays imperative. But it brings with it a new and complex relationship between customer and utility. This is because smart grid allows consumers to control energy usage via a home computer. With smart buildings into the mix and their appliances can control energy usage without the consumer doing anything. And with increased use of solar energy and other distributed technologies, the home also becomes power plant and storage facility for the electric utility. Companies willing to tackle industry model innovation and sit at the nexus of new complex relationships among business partners and customers will be well positioned to create and capture new demand for emerging products and services. Strong growth in revenues and profits  albeit accompanied by some risks  is achievable in multisided business models because of the embedded network economies of scale (i.e., margins increase with network size), says the report. IBM calls this new business model a multisided platform. What does it look like? Manufacturers, retailers and shoppers all benefit from having a single location where they can meet and transact business. A wider variety of stores and services brings more shoppers; more shoppers bring higher sales volumes for manufacturers and lower costs for retailers (and, in theory, also lower prices for shoppers). Thus, some element of network economy is bundled into the shopping center value proposition. The platform owner (the shopping center operator) extracts some of this value in the form of rent to store owners and, in some cases, service fees to shoppers, says the report. If indeed this is the future, it wont be embraced quickly or easily by utilities, which are notorious for their caution. For those who do move forward, here is some of what IBM advises. Be sure your current customer base is sizable enough to ensure that you get a meaningful head start. But dont hurry. History has shown that later movers may actually benefit from standing back from the first wave of early adopters. Time the announcement of your new business model carefully to avoid shocking long-time constituencies or alerting rivals too soon. But in the UK, the cat has already leaped out of the bag! The UK Regulator – Ofgems duty to contribute to the achievement of sustainable development promoted this duty, placing it on an equal footing with its duties to meet reasonable demand and financing authorised activities. The principle objective, to protect the interests of consumers, refers to future as well as existing consumers. These changes underline Ofgems important and developing role in shaping the future of gas and electricity industries in a sustainable manner.The UK is facing a future that involves increased geopolitical risks to energy security, potentially higher energy prices and the need to do much more to reduce greenhouse gas emissions while making sure everyone can afford to adequately heat their homes. While much of what is needed to deliver sustainability is not within the regulators direct control, a responsibility to facilitate change by engaging in the debate, trying to persuade relevant players to make changes where required and contributing information and expertise where it can. So whats already implemented in the UK? Climate Levy Tax incentives – Look at you next bill and spot this tax! Informing the customer and proving ‘idiots’ guides to understand the available technologies and energy savings available. Providing engineering design and installation solutions. The correct customer incentives to explore and implements these technologies. The Department for Energy and Climate Change wants to see 47 million meters in 26 million properties by 2020. It is hoped the technology will help people cut their energy bills by paying more attention to usage. Smart meters have a visual display allowing customers to see exactly how much electricity and gas they are using and relay the data to energy firms automatically. Trials of smart meters have resulted in some people moderating their energy use. The government had already announced that it wanted all UK homes to have smart meters by 2020. What is new today is that, following a consultation period, it has now decided how that will happen. The main energy suppliers will be responsible for the roll-out. This was the government’s preferred option, although there was a debate in the industry over whether it could be done another way, for example by the regional electricity distribution companies. The government has also outlined its early thinking on the buzzwords in the industry at the moment – smart grids. Potential savings outlined already by ministers are only a fraction of the current average annual bill of more than £800 for gas and £445 for electricity. The £28 a year figure for savings has been cited as a conservative estimate for a typical household. But the DECC says case studies had shown people could reduce their bills by about £100 a year as the meters can encourage changes in behaviour. “Smart meters will put the power in people’s hands, enabling us all to control how much energy we use, cut emissions and cut bills,” said Energy and Climate Change Minister Lord Hunt. They will be able to recoup the cost from customers through higher bills or upfront fees, but competition between suppliers is expected to ensure only some of the expense is passed on. The companies stand to make big cost savings themselves, with the need for teams of meter readers becoming a thing of the past. The plans, which also confirm that each meter will include a standalone display device, were welcomed by the big energy companies. “We are delighted the government is moving forward with its plans for the roll-out of this technology throughout Britain,” said British Gas managing director Phil Bentley. Mark Daeche, of energy company First Utility, said the mass roll-out of smart meters would not begin until 2013. But from next summer, all First Utility customers who elected to have a smart meter would be supplied with one. He welcomed the format of giving suppliers the responsibility for the supply of meters instead of a system of regional franchises. Plans have also been announced for a smart grid to manage the flows of electricity and to increase the use of renewable energy. In the past the National Grid has delivered electricity from large power plants to our homes. In the future the grid will need to be much smarter, according to BBC business reporter John Moylan. 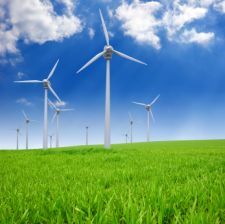 “Computers will have to handle more volatile sources of electricity, such as windfarms,” he said. Suggesting turning off the lights in our buildings has been a constant theme. Saving or conserving energy, especially when the cleaning crew and security personnel are the only ones occupying a 250,000 sq ft office tower, makes sense at a very basic level. You would think that a simple concept such as conserving energy in our built environment would be easy to deploy. Given that energy, and thus our independence, is on everyones mind, combined with the fact that buildings use 40+% of the total daily energy spend, one would expect it to be a high priority. 5) many of these technologies involve CAPEX or in some cases initial impacts to OPEX investments and without the motivation of a return, never made it past the budgeting process. There have been bursts of interest in this topic by the built environment over the last 5-7 years. In fact there are case studies of real estate companies who have implemented sophisticated technology solutions to monitor and manage their energy consumption with a much greater level of accuracy. Over the last 24-30 months, many of our trade associations have also joined in the battle to conserve and begun to aggressively educate their memberships on conserving energy. While all of these green initiatives have been positive, there has been little discussion on the role that technology, automation and innovation can play. While insulated windows an important part of the strategy so is a lighting strategy that can reduce energy costs by 50%. Enter the Smart Grid discussion. About 2-3 years ago the discussion of the Smart Grid started to heat up. Major companies like GE, IBM, Siemens and, most recently Cisco and Google, started to beat the drum on the benefits of being able to manage electricity in more sophisticated ways. Instead of producing power in big old clunky power plants and broadcasting the energy down very old asynchronous (one way) power lines, the idea has emerged of a networked, very smart, easy to manage electrical infrastructure that connects both your refrigerator to the network as well as the solar panel or wind turbine that you have in your backyard or the roof of your office building. The idea is big, the benefits are big, the issues are big, and so are the challenges. While the marketing of many of these large smart grid companies would lead you to believe that the technology is in place and everything has been figured out, there are a mountain of questions ranging from privacy issues to standards and everything in between. One of those big issues to be figured out is how to we connect a smart building to the smart grid and what if were starting with a building that is not so smart. One of the most basic questions that need to be answered is who in a building takes charge of this issue. Buildings have many number of different tenant landlord relationships, from owner occupied to multi-tenant. The relationship in many cases will influence who takes the lead on this important topic. Once the business side of the equation is figured out, then you move to the building technology and ultimately the relationship with the smart grid. These are very big questions and in many respects are the primary reasons that so many building owners have not initiated an energy plan. The other major reasons for slow response to this issue is the maturity of the technology (still evolving) and the regulatory role of local, and national government agencies. If you break the smart grid into three distinct categories it is a little easier to understand. 3) the end user, which in our world translates to the building. These make up the major components of the smart grid. When we isolate the buildings role its easy to understand why this is such a complex issue. Its not only the connectivity of the building to the smart grid, but also the internal infrastructure of the building that needs to be automated in order to create a completely digital, transparent connection. Connecting a building to the smart grid without considering the tenant space will leave you with less than desired results. The topic gets even more complex when you consider all the other building technologies that need to be considered for integration into the building network such as security, tenant communications etc. at the same time you are trying to figure out the connectivity into the smart grid for the purpose energy management and conservation. The benefits of the smart grid begin to get very interesting when you start talking about how a commercial building owner could gain financially from this concept. Just imagine youre at 30,000 feet looking down on a major city and picture all the buildings being turned into individual solar and other renewable energy source power plants that could sell unused energy back to utilities via smart grid technologies. There are some who have speculated that this could be a significant income stream for owners and operators once the idea is adequately developed. The bottom line is that the idea of smart buildings connecting to the smart grid is an idea whose time has come. Whether adoption is fueled by financial opportunities or by strict legislation, this idea is not going away. In the early stages, as with all new technologies and ideas, there are more questions than answers. However, last weeks announcement by the US Obama administration on their 3.2 billion dollar commitment to the smart grid is sure to advance the topic and produce real results. The question remains how will BUILDINGS CONNECT to the SMART GRID, with technology companies developing products and exploring this new major industry (as it will become). Which company will become the brand leader, but even more important is which real estate owners will become the known to champion this technology, and get an competitive edge on its rivals. Two new utility companies have joined The Global Intelligent Utility Network (IUN) Coalition, which is a group formed by IBM that is pushing best practices for smart grid technologies and installations. The new members are CPFL Energia (Brazil) and Liander (The Netherlands). The four U.S. members (CenterPoint Energy, Pepco Holdings, Progress Energy, and San Diego Gas and Electric) collectively were granted $3.4 billion last month in federal funding for their various smart grid pilots and projects. The collective mission statement of the Global IUN is to use digital intelligence to help reduce outages and faults, manage demand and integrate new sources of energy such as wind into the power grid. The group was responsible for developing the Smart Grid Maturity Model, which is now being used by more than 60 utilities as part of smart grid strategy and planning. One trend that will pick up steam in 2010 is technologies and alliances that bring the current home broadband infrastructure (Home Automation network) and the emerging smart grid infrastructure closer together. After all, viagra canadian pharmacy as more homes embrace high-speed Internet access (wired OR wireless), it makes sense that smart meters and other smart grid devices communicate via what is already in place. Anticipating this convergence of interests, iControl Networks has come out with a platform called ConnectedLife Energy Management. The technology, which is intended for broadband operators, utility companies and other service providers, will allow for the development of demand response systems and other energy-efficiency services. The company expects Connected Life Energy Management to be commercially available to consumers sometime in 2010. It would allow for applications such as scheduled energy usage that is tailored to meet certain efficiency or carbon footprint goals. 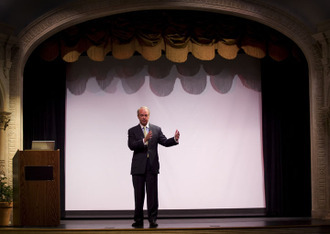 At Apple co-founder Mike Markullas Venetian Hotel-styled private theater in this posh Palo Alto suburb, the chairman of Sun Microsystems, makers of Java, and CEO of Duke Energy, makers of 36,000 megawatts of electricity in coal and nuclear plants, shared the stage. The CEOs found common ground pushing a vision of the future where light switches are superfluous and any device that uses power is networked, easily automated, and far more energy efficient. 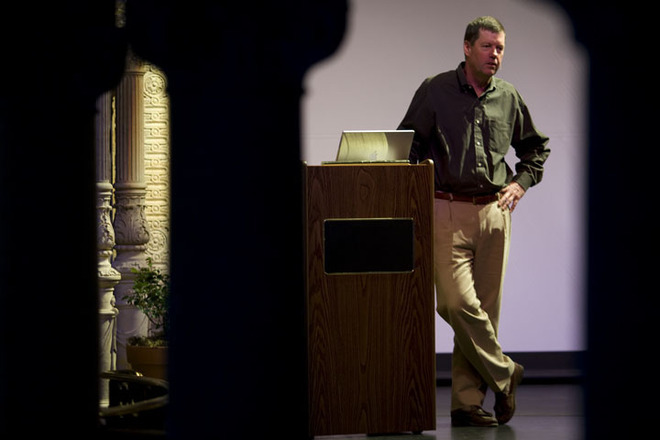 Holding up a standard Sun identification card, Sun Chairman of the Board Scott McNealy noted that it was faster than an Apple II computer. “We can connect anything that is more than a dollar in value,” he said. But McNealys declaration that he was “over” the network was the real highlight of the hour-long event to celebrate the twentieth anniversary of Markullas post-Apple endeavor, Echelon, which makes sensors and controls for all types of devices. “I want my stuff to be on the network” said McNealy. Beyond his glib distaste for social networking, McNealy and Jim Rogers, Duke Energys CEO, presented a serious case that the future of networking lies with your toaster, lights and curtains. By turning “dumb” devices into nodes on a smart network, the businessmen said that the entire economy could be restructured to use energy more efficiently. 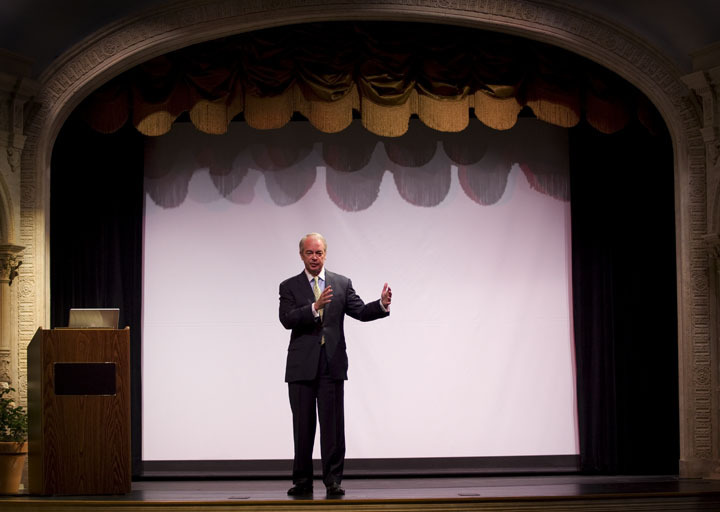 “I believe the most energy efficient economy is going to be the one that provides the greatest standard of living for its people,” Rogers said. Rogers also noted that utilities would have to redefine their businesses away from commodity power and start making money by helping their customers control, not just use, their electricity. Thats a major change in thinking for utilities that previously considered their job finished when the electricity hit your meter. Though they painted grand visions of what the future could hold, both executives said there were many challenges to be met in creating the network of things. Cost and complexity have slowed the adoption of home automation systems, but all three companies clearly see an opportunity to capitalize on the high cost of energy and increasing concern over carbon emissions. McNealy even dropped Echelons protocol LonWorks into his solution for the future. Rogers vision was equally amibitious and showed that the North Carolina-based CEO knew his big-thinking Silicon Valley audience. Images: Jim Merithew. Top: Scott McNealy speaks to the crowd. 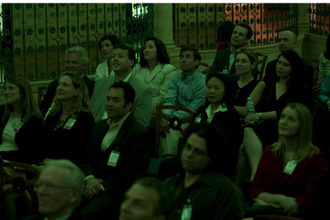 Middle: The crowd is bathed in green LED light during a demo of the rooms fancy lighting system. Bottom: Duke Energy CEO Jim Rogers lays out his plan for the future of a smarter electrical grid. Accenture has been chosen by Amsterdam to run a scheme designed to create Europe’s first ‘intelligent city’. The aim of the Amsterdam Smart City programme is to introduce sustainable and economically viable projects that will help Amsterdam reduce its carbon footprint and meet the European Union’s 2020 emissions and energy reduction targets. Among the projects to reduce energy consumption are a smart electric grid, smart meters and in-home feedback displays, smart building technologies and electric vehicles. Accenture will work on the programme in partnership with the Amsterdam Innovation Motor, a city-affiliated agency that will build public and private sector co-operation to support Amsterdam Smart City. CHARLOTTE, N.C. –Duke Energy announced it will join forces with Cisco Systems Inc., the worlds largest network communications company, to fast-track development of Duke Energys state-of-the-art electric smart grid. The two companies will jointly evaluate a variety of smart grid communications hardware and software, and oversee installation and testing of selected equipment and software throughout Duke Energys electric grid.In addition, Cisco will work with Duke Energy to develop and install home energy management devices to help customers control and reduce their electricity consumption. Todd Arnold, senior vice president for smart grid and customer systems at Duke Energy, Americas third-largest electric utility. The three-year partnership is the latest development in Duke Energys effort to rapidly convert its existing electricity delivery infrastructure into an advanced smart grid that uses two-way digital communication to reduce energy usage, improve efficiency, bolster system reliability, detect power outages, and integrate solar and other renewable energy sources into the electric grid. Cisco Systems, working closely with Duke Energy, will develop a highly refined, end-to-end, smart grid communications architecture – one that both companies believe will be among the most comprehensive and interoperable in the electric utility industry. The newly created architecture will be based on what the industry calls internet protocol-based open standards – an approach that permits easy accommodation of new and emerging communications technology as it becomes available in future years. Replacing our analog electric grid with advanced digital technology to create a 21st century electricity delivery system largely involves data, networks and communications – all of it Ciscos expertise, Arnold said. In Ohio, Duke Energy later this year will launch a five-year mass deployment of smart grid technology, including more than 700,000 electric smart meters and 450,000 natural gas smart meters. In Indiana, Duke Energy is seeking approval from the Indiana Utility Regulatory Commission to install extensive smart grid technology, including approximately 800,000 smart meters. Duke Energy announced it had reached a settlement agreement with the Indiana Office of Utility Consumer Counselor and key consumer and business groups regarding the companys Indiana smart grid proposal. In addition to smart meters, Duke Energy plans to install a large amount of distribution automation – both hardware and software – to improve system efficiency and reliability on its electric grid in both Indiana and Ohio. The company also is laying the groundwork to bring large-scale smart grid technology to three other states it serves – North Carolina, South Carolina and Kentucky. Working with innovative industry leaders like Duke Energy, Cisco will deliver an end-to-end network infrastructure from power plant to customer in order to manage electricity supply and consumption both efficiently and in an environmentally responsible manner, said Ciscos De Beer. You are currently browsing the archives for the Smart Grid Technology category.